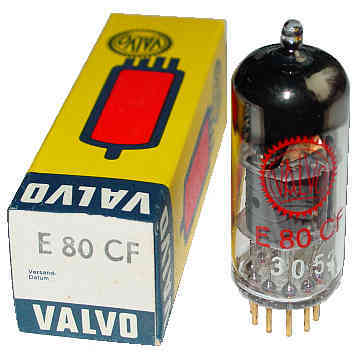 This is an original, high reliability, individually numbered  Valvo SQ E80CF Medium-Mu Triode, Sharp-Cutoff Pentode electronic tube. Nearest good subtitute is the 6085. This 10,000 hours certified, high reliability, shock and vibration resistant industrial tube is designed for RF [Radio Frequency] and AF [Audio Frequency] amplifier use. This frame grid tube has gold plated contacts and is useable in high frequency, high gain, low noise circuits up to 300 MHz. A medium-mu triode is useful for many other special purpose circuits like oscillators, RF amplifiers, multivibrators, blocking oscillator, replacement part, circuit research and experimentation or for replacement, antique radio, instrument, TV television restoration projects or to set up a private vacuum tube museum. It is NOS tube - New Old Stock, unused, boxed, excellent condition.